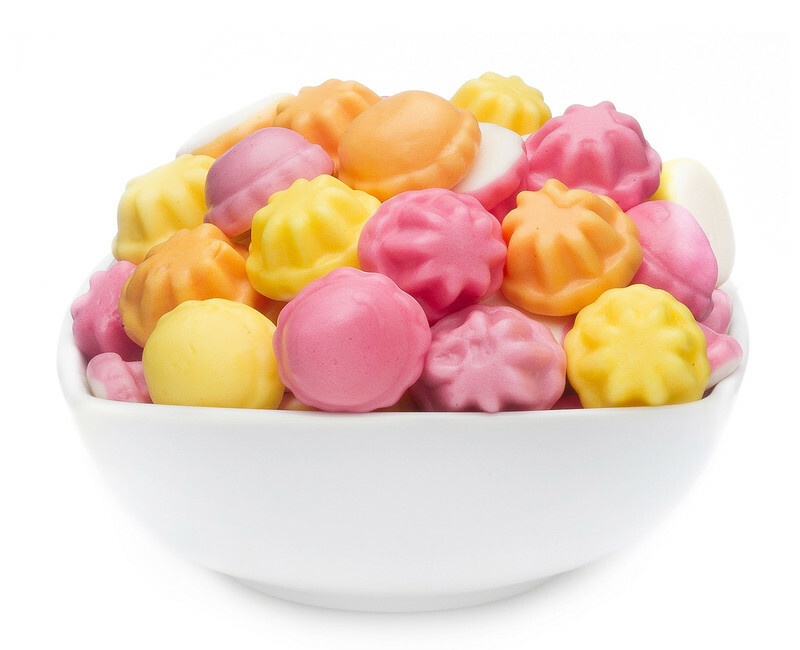 These yoghurt fruit gums in the shape of tartlets filled with fruit juice are fruity, fresh and delicious! A clear recommendation from our enthusiasts! Glucose syrup; sugar; 6,2% low fat yoghurt powder; gelatine; acids:citric acid, lactic acid; gelling agent:pectin; milk protein; fruit juice concentrates(apricot, elderberry, lemon, sour cherry); flavourings; colours:carmines, curcumin; colouring foods(spirulina); palm kernel oil, glazing agent:bees wax white and yellow, carnauba wax. These yoghurt-gums come with four different fruit-fillings. What they have in common? The filling is embedded in finest yoghurt. A must-have for fruit-gum enthusiasts! Fillings include sour cherry, apricot, blueberry and lemon. The perfect combination of 'fruity' and yoghurt! The modestly sour taste of these fruit gums harmonizes well with their fresh fruit fillings with a spot-on sweetness. More fun than mixing yoghurt with fruits yourself, for sure. Use the beauty of tartlets! These fruit gums are absolute all-rounders. Anything this delicious will be fun for anyone - regardless of age. They will work as a quick snack, or as decoration. Have you ever put a tartlet on a tart? It might be about time!